This article is about the historical region. For the modern-day region, see Andalusia. For the district in Kuwait, see Al Andalus, Kuwait. For the musical group, see Al-Andalus Ensemble. Al-Andalus (Arabic: الأندلس‎, trans. al-ʼAndalus; Spanish: Al-Ándalus; Portuguese: Al-Ândalus; Aragonese: Al-Andalus; Catalan: Al-Àndalus; Berber: Andalus or Wandalus), also known as Muslim Spain or Islamic Iberia, was a medieval Muslim cultural domain and territory occupying at its peak most of what are today Spain and Portugal. (At its greatest geographical extent, in the eighth century, southern France—Septimania—was briefly under its control.) The name more generally describes parts of the Iberian Peninsula governed by Muslims (given the generic name of Moors) at various times between 711 and 1492, though the boundaries changed constantly as the Reconquista progressed. Following the Muslim conquest of Hispania, Al-Andalus, then at its greatest extent, was divided into five administrative units, corresponding roughly to modern Andalusia, Portugal and Galicia, Castile and León, Aragon, county of Barcelona and Septimania. As a political domain, it successively constituted a province of the Umayyad Caliphate, initiated by the Caliph Al-Walid I (711–750); the Emirate of Córdoba (c. 750–929); the Caliphate of Córdoba (929–1031); and the Caliphate of Córdoba's taifa (successor) kingdoms. Rule under these kingdoms saw a rise in cultural exchange and cooperation between Muslims and Christians, with Christians and Jews considered as subject people who paid a special tax, Jizya, to the state which provided internal autonomy and offered certain protection by Muslim rulers. Under the Caliphate of Córdoba, Al-Andalus was a beacon of learning, and the city of Córdoba became one of the leading cultural and economic centres in Europe and throughout the Mediterranean Basin and the Islamic world. A number of achievements that advanced Islamic and Western science came from Al-Andalus including major advances in trigonometry (Geber), astronomy (Arzachel), surgery (Abulcasis), pharmacology (Avenzoar), and other fields. Al-Andalus became a major educational center for Europe and the lands around the Mediterranean Sea as well as a conduit for culture and science between the Islamic and Christian worlds. For much of its history, Al-Andalus existed in conflict with Christian kingdoms to the north. After the fall of the Umayyad caliphate, Al-Andalus was fragmented into a number of minor states and principalities. Attacks from the Christians intensified, led by the Castilians under Alfonso VI. The Almoravid empire intervened and repelled the Christian attacks on the region, deposing the weak Andalusi Muslim princes and included Al-Andalus under direct Berber rule. In the next century and a half, Al-Andalus became a province of the Berber Muslim empires of the Almoravids and Almohads, both based in Marrakesh. Ultimately, the Christian kingdoms in the north of the Iberian Peninsula overpowered their Muslim neighbors. In 1085, Alfonso VI captured Toledo, starting a gradual decline of Muslim power. With the fall of Córdoba in 1236, most of the south quickly fell under Christian rule and the Emirate of Granada became a tributary state of the Kingdom of Castile two years later. In 1249, the Portuguese Reconquista culminated with the conquest of the Algarve by Afonso III, leaving Granada as the only Muslim state on the Iberian Peninsula. Finally, on January 2, 1492, Emir Muhammad XII surrendered the Emirate of Granada to Queen Isabella I of Castile, completing the Christian Reconquista of the peninsula. Although Al-Andalus ended as a political entity, it left a lasting influence that can be seen in the cuisine, architecture, gardens and textiles of Spain and Portugal, particularly in the south. The etymology of "Al-Andalus" is disputed, as is the extent of Iberian territory encompassed by the name over the centuries. The name is first attested to by inscriptions on coins minted by the new Muslim government in Iberia, circa 715 (the uncertainty in the year is due to the fact that the coins were bilingual in Latin and Arabic and the two inscriptions differ as to the year of minting). At least three specific etymologies have been proposed in Western scholarship, all presuming that the name arose after the Roman period in the Iberian Peninsula's history. Their originators or defenders have been historians. Recently, linguistics expertise has been brought to bear on the issue. Arguments from toponymy (the study of place names), history, and language structure demonstrate the lack of substance in all following proposals, and evidence has been presented that the name predates, rather than postdates, the Roman occupation. The name Andalusia or Vandalusia is traditionally believed to be derived from Vandal (the Germanic tribe that briefly colonized parts of Iberia from 409 to 429). The proposal is sometimes associated with the 19th-century historian Reinhart Dozy, but it predates him and he recognized some of its shortcomings. Although he accepted that Al-Andalus derived from Vandal, he believed that geographically it referred only to the harbour from which the Vandals departed Iberia for (North) Africa—the location of which harbour was unknown. In the 1980s, the historian Heinz Halm, also rejecting the Vandal proposal, originated an innovative alternative. Halm took as his points of departure ancient reports that Germanic tribes in general were reported to have distributed conquered lands by having members draw lots, and that Iberia during the period of Visigothic rule was sometimes known to outsiders by a Latin name, Gothica Sors, whose meaning is 'Gothic lot'. Halm thereupon speculated that the Visigoths themselves might have called their new lands "lot lands" and done so in their own language. However, the Gothic language version of the term Gothica Sors is not attested. Halm claimed to have been able to reconstruct it, proposing that it was *landahlauts (the asterisk is the standard symbol among linguists for a linguistic form that is proposed but has not been attested). Halm then suggested that the hypothetical Gothic language term gave rise to both the attested Latin term, Gothica Sors (by translating the meaning) and the Arabic name, Al-Andalus (by phonetic imitation). However, Halm did not offer evidence (historical or linguistic) that any of the language developments in his argument had in fact occurred. Another proposal is that Andalus is an Arabic-language version of the name Atlantis. This idea has recently been defended by the Spanish historian Vallvé, but purely on the grounds that it is allegedly plausible phonetically and would explain several toponymic facts (no historical evidence was offered). Arabic texts offering the first mentions of the island of Al-Andalus and the sea of al-Andalus become extraordinarily clear if we substitute this expressions with "Atlantis" or "Atlantic". The same can be said with reference to Hercules and the Amazons whose island, according to Arabic commentaries of these Greek and Latin legends, was located in jauf Al-Andalus—that is, to the north or interior of the Atlantic Ocean. The Island of Al-Andalus is mentioned in an anonymous Arabic chronicle of the conquest of Iberia composed two to three centuries after the fact. It is identified as the location of the landfall of the advance guard of the Moorish conquest of Iberia. The chronicle also says that "Island of al-Andalus" was subsequently renamed "Island of Tarifa". The preliminary conquest force of a few hundred, led by the Berber chief, Tarif abu Zura, seized the first bit of land they encountered after crossing the Strait of Gibraltar in 710. The main conquest force led by Tariq ibn Ziyad followed them a year later. The landfall, now known in Spain as either Punta Marroquí or Punta de Tarifa, is in fact the southern tip of an islet, presently known as Isla de Tarifa or Isla de las Palomas, just offshore of the Iberian mainland. This testimony of the Arab chronicle, the modern name Isla de Tarifa, and the above-mentioned toponymic evidence that Andaluz is a name of pre-Roman origin taken together lead to the supposition that the Island of Andalus is the present day Isla de Tarifa, which lies just offshore from the modern day Spanish city of Tarifa. The extension of the scope of the designation "Al-Andalus" from a single islet to all of Iberia has several historical precedents. During the caliphate of the Umayyad Caliph Al-Walid I, the Berber commander Tariq ibn-Ziyad led a small force that landed at Gibraltar on April 30, 711, ostensibly to intervene in a Visigothic civil war. After a decisive victory over King Roderic at the Battle of Guadalete on July 19, 711, Tariq ibn-Ziyad, joined by Arab governor Musa ibn Nusayr of Ifriqiya, brought most of the Visigothic Kingdom under Muslim occupation in a seven-year campaign. They crossed the Pyrenees and occupied Visigothic Septimania in southern France. Most of the Iberian peninsula became part of the expanding Umayyad empire, under the name of Al-Andalus. It was organized as a province subordinate to Ifriqiya, so, for the first few decades, the governors of al-Andalus were appointed by the emir of Kairouan, rather than the Caliph in Damascus. The regional capital was set at Córdoba, and the initial influx of Muslim colonists were widely distributed – Arab colonists were assigned to the south and east, while Berber colonists were scattered across the west and center. Visigothic lords who agreed to recognize Muslim suzerainty were allowed to retain their fiefs (notably, in Murcia, Galicia, and the Ebro valley). Resistant Visigoths took refuge in the Cantabrian highlands, where they carved out a rump state, the Kingdom of Asturias. In the 720s, the al-Andalus governors launched several sa'ifa raids into Aquitaine, but were severely defeated by Duke Odo the Great of Aquitaine at the Battle of Toulouse (721). However, after crushing Odo's Berber ally Uthman ibn Naissa on the eastern Pyrenees, Abdul Rahman Al Ghafiqi led an expedition north across the western Pyrenees and defeated the Aquitanian duke, who in turn appealed to the Frankish leader Charles Martel for assistance, offering to place himself under Carolingian sovereignty. At the Battle of Poitiers in 732, the al-Andalus raiding army was defeated by Charles Martel. In 734, the Andalusi launched raids to the east, capturing Avignon and Arles and overran much of Provence. In 737, they climbed up the Rhône valley, reached as far as Burgundy. Charles Martel of the Franks, with the assistance of Liutprand of the Lombards, invaded Burgundy and Provence and expelled the raiders by 739. Islamic-period garden in the Alhambra. Relations between Arabs and Berbers in al-Andalus had been tense in the years after the conquest. Berbers heavily outnumbered the Arabs in the province, and had done the bulk of the fighting, but they had been given the lesser plums of the conquest and were assigned the harsher duties (e.g. garrisoning the more troubled areas). Although some Arab governors had cultivated their Berber lieutenants, others had grievously mistreated them. Mutinies by Berber soldiers were frequent, e.g. in 729, the Berber commander Munnus revolted and managed to carve out a rebel state in Cerdanya for a spell. In 740, a great Berber Revolt erupted in the Maghreb (North Africa). To put down the rebellion, the Umayyad Caliph Hisham dispatched a large Arab army, composed of regiments (Junds) of Bilad Ash-Sham to North Africa. But the great Syrian army was crushed by the Berber rebels at the Battle of Bagdoura (in Morocco). Heartened by the victories of their North African brethren, the Berbers of al-Andalus quickly raised their own revolt. Berber garrisons in northern Spain mutinied, deposed their Arab commanders, and organized a large rebel army to march against the strongholds of Toledo, Cordoba, and Algeciras. 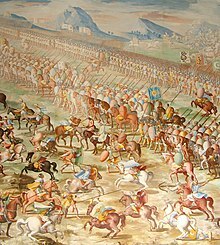 The Al-Andalus Arab governor, joined by the remnant of the Syrian army (some 10,000) which had fled across the straits, crushed the Berber rebels in a series of ferocious battles in 742. However, a quarrel immediately erupted between the Syrian commanders and the older Andalusi Arabs. The Syrians defeated the Andalusi at the hard-fought Battle of Aqua Portora in August 742 but were too few to impose themselves on the province. The quarrel was settled in 743 with the distribution of the Syrians in regimental fiefs across Al-Andalus – the Damascus jund was established in Elvira (Granada), the Jordan jund in Rayyu (Málaga and Archidona), the Jund Filastin in Medina-Sidonia and Jerez, the Emesa (Hims) jund in Seville and Niebla, and the Qinnasrin jund in Jaén. The Egypt jund was divided between Beja (Alentejo) in the west and Tudmir (Murcia) in the east. The arrival of the Syrians increased substantially the Arab element in the Iberian peninsula and helped strengthen the Muslim hold on the south. However, at the same time, unwilling to be governed, the Syrian junds carried on an existence of autonomous feudal anarchy, severely destabilizing the authority of the governor of al-Andalus. These disturbances and disorders also allowed the Franks, now under the leadership of Pepin the Short, to invade the strategic strip of Septimania in 752, hoping to deprive al-Andalus of an easy launching pad for raids into Francia. After a lengthy siege, the last Arab stronghold, the citadel of Narbonne, finally fell to the Franks in 759. Al-Andalus was sealed off at the Pyrenees. The third consequence of the Berber revolt was the collapse of the authority of the Damascus Caliphate over the western provinces. With the Umayyad Caliphs distracted by the challenge of the Abbasids in the east, the western provinces of the Maghreb and al-Andalus spun out of their control. From around 745, the Fihrids, an illustrious local Arab clan descended from Oqba ibn Nafi al-Fihri, seized power in the western provinces and ruled them almost as a private family empire of their own – Abd al-Rahman ibn Habib al-Fihri in Ifriqiya and Yūsuf al-Fihri in al-Andalus. The Fihrids welcomed the fall of the Umayyads in the east, in 750, and sought to reach an understanding with the Abbasids, hoping they might be allowed to continue their autonomous existence. But when the Abbasids rejected the offer and demanded submission, the Fihrids declared independence and, probably out of spite, invited the deposed remnants of the Umayyad clan to take refuge in their dominions. It was a fateful decision that they soon regretted, for the Umayyads, the sons and grandsons of caliphs, had a more legitimate claim to rule than the Fihrids themselves. Rebellious-minded local lords, disenchanted with the autocratic rule of the Fihrids, intrigued with the arriving Umayyad exiles. The interior of the Mosque–Cathedral of Córdoba formerly the Great Mosque of Córdoba. The original mosque (742), since much enlarged, was built on the site of the Visigothic Christian 'Saint Vincent basilica' (600) then reconquered and designated the Christian Catedral de Nuestra Señora de la Asunción in 1236. In 756, the exiled Umayyad prince Abd al-Rahman I (nicknamed al-Dākhil, the 'Immigrant') ousted Yūsuf al-Fihri to establish himself as the Emir of Córdoba. He refused to submit to the Abbasid caliph, as Abbasid forces had killed most of his family. Over a thirty-year reign, he established a tenuous rule over much of al-Andalus, overcoming partisans of both the al-Fihri family and of the Abbasid caliph. For the next century and a half, his descendants continued as emirs of Córdoba with nominal control over the rest of Al-Andalus and sometimes parts of western North Africa, but with real control, particularly over the marches along the Christian border, vacillating depending on the competence of the individual emir. Indeed, the power of emir Abdallah ibn Muhammad (circa 900) did not extend beyond Córdoba itself. But his grandson Abd-al-Rahman III, who succeeded him in 912, not only rapidly restored Umayyad power throughout al-Andalus but extended it into western North Africa as well. In 929 he proclaimed himself Caliph, elevating the emirate to a position competing in prestige not only with the Abbasid caliph in Baghdad but also the Shi'ite caliph in Tunis—with whom he was competing for control of North Africa. The period of the Caliphate is seen as the golden age of Al-Andalus. Crops produced using irrigation, along with food imported from the Middle East, provided the area around Córdoba and some other Andalusī cities with an agricultural economic sector that was the most advanced in Europe by far. Among European cities, Córdoba under the Caliphate, with a population of perhaps 500,000, eventually overtook Constantinople as the largest and most prosperous city in Europe. Within the Islamic world, Córdoba was one of the leading cultural centres. 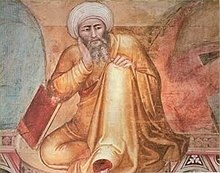 The work of its most important philosophers and scientists (notably Abulcasis and Averroes) had a major influence on the intellectual life of medieval Europe. Muslims and non-Muslims often came from abroad to study in the famous libraries and universities of Al-Andalus after the reconquest of Toledo in 1085. The most noted of these was Michael Scot (c. 1175 to c. 1235), who took the works of Ibn Rushd ("Averroes") and Ibn Sina ("Avicenna") to Italy. This transmission was to have a significant impact on the formation of the European Renaissance. The Córdoba Caliphate effectively collapsed during a ruinous civil war between 1009 and 1013, although it was not finally abolished until 1031 when Al-Andalus broke up into a number of mostly independent mini-states and principalities called taifas. These were generally too weak to defend themselves against repeated raids and demands for tribute from the Christian states to the north and west, which were known to the Muslims as "the Galician nations", and which had spread from their initial strongholds in Galicia, Asturias, Cantabria, the Basque country, and the Carolingian Marca Hispanica to become the Kingdoms of Navarre, León, Portugal, Castile and Aragon, and the County of Barcelona. Eventually raids turned into conquests, and in response the Taifa kings were forced to request help from the Almoravids, Muslim Berber rulers of the Maghreb. Their desperate maneuver would eventually fall to their disadvantage, however, as the Almoravids they had summoned from the south went on to conquer and annex all the Taifa kingdoms. In 1086 the Almoravid ruler of Morocco, Yusuf ibn Tashfin, was invited by the Muslim princes in Iberia to defend them against Alfonso VI, King of Castile and León. In that year, Tashfin crossed the straits to Algeciras and inflicted a severe defeat on the Christians at the Battle of Sagrajas. By 1094, Yusuf ibn Tashfin had removed all Muslim princes in Iberia and had annexed their states, except for the one at Zaragoza. He also regained Valencia from the Christians. The Almoravids were succeeded by the Almohads, another Berber dynasty, after the victory of Abu Yusuf Ya'qub al-Mansur over the Castilian Alfonso VIII at the Battle of Alarcos in 1195. In 1212 a coalition of Christian kings under the leadership of the Castilian Alfonso VIII defeated the Almohads at the Battle of Las Navas de Tolosa. The Almohads continued to rule Al Andalus for another decade, though with much reduced power and prestige. The civil wars following the death of Abu Ya'qub Yusuf II rapidly led to the re-establishment of taifas. The taifas, newly independent but now weakened, were quickly conquered by Portugal, Castile, and Aragon. After the fall of Murcia (1243) and the Algarve (1249), only the Emirate of Granada survived as a Muslim state, and only as a tributary of Castile. Most of its tribute was paid in gold that was carried to Iberia from present-day Mali and Burkina Faso through the merchant routes of the Sahara. The last Muslim threat to the Christian kingdoms was the rise of the Marinids in Morocco during the 14th century. They took Granada into their sphere of influence and occupied some of its cities, like Algeciras. However, they were unable to take Tarifa, which held out until the arrival of the Castilian Army led by Alfonso XI. The Castilian king, with the help of Afonso IV of Portugal and Peter IV of Aragon, decisively defeated the Marinids at the Battle of Río Salado in 1340 and took Algeciras in 1344. Gibraltar, then under Granadian rule, was besieged in 1349–50. Alfonso XI and most of his army perished by the Black Death. His successor, Peter of Castile, made peace with the Muslims and turned his attention to Christian lands, starting a period of almost 150 years of rebellions and wars between the Christian states that secured the survival of Granada. In 1469 the marriage of Ferdinand of Aragon and Isabella of Castile signaled the launch of the final assault on the Emirate of Granada (Gharnatah). The King and Queen convinced the Pope to declare their war a crusade. The Christians crushed one center of resistance after another and finally, in January 1492, after a long siege, the Moorish sultan Muhammad XII surrendered the fortress palace, the renowned Alhambra (see Fall of Granada). The last Muslim bastion, Granada, fell in 1492. By this time Muslims in Castile numbered half a million. After the fall, "100,000 had died or been enslaved, 200,000 emigrated, and 200,000 remained as the residual population. Many of the Muslim elite, including Muhammad XII, who had been given the area of the Alpujarras mountains as a principality, found life under Christian rule intolerable and passed over into North Africa." Under the conditions of the Capitulations of 1492, the Muslims in Granada were to be allowed to continue to practice their religion. The desire to reconquer, or more specifically re-Islamicize, Al-Andalus has been used as rhetoric by leaders of Islamic states and has been discussed by Spanish politicians. Osama bin Laden, for example, several times spoke of Al-Andalus, which was reported after the 2004 Madrid bombings. The Muslim Brotherhood and ISIS have also expressed an intention to "retake" al-Andalus. The society of Al-Andalus was made up of three main religious groups: Christians, Muslims, and Jews. The Muslims, though united on the religious level, had several ethnic divisions, the main being the distinction between the Berbers and the Arabs. Mozarabs were Christians who had long lived under Muslim rule, adopting many Arabic customs, art, and words, while still maintaining their Christian rituals and their own Romance languages. Each of these communities inhabited distinct neighborhoods in the cities. In the 10th century a massive conversion of Christians took place, and muladies (Muslims of native Iberian origin), formed the majority of Muslims. The Muladies had spoken in a Romance dialect of Latin called Mozarabic while increasingly adopting the Arabic language, which eventually evolved into the Andalusi Arabic in which Muslims, Jews, and Christians became monolingual in the last surviving Muslim state in the Iberian Peninsula, the Emirate of Granada (1232-1492). Eventually, the Muladies, and later the Berber tribes, adopted an Arabic identity like the majority of subject people in Egypt, the Levant, Mesopotamia, and North Africa. Muladies, together with other Muslims, comprised eighty percent of the population of Al-Andalus by around 1100. The Berbers, who made up the bulk of the invaders, lived in the mountainous regions of what is now the north of Portugal and in the Meseta Central, while the Arabs settled in the south and in the Ebro Valley in the northeast. The Jews worked mainly as tax collectors, in trade, or as doctors or ambassadors. At the end of the 15th century there were about 50,000 Jews in Granada and roughly 100,000 in the whole of Islamic Iberia. The non-Muslims were given the status of ahl al-dhimma (the people under protection), with adults paying a "Jizya" tax, equal to one dinar per year with exemptions for old people, women, children, and the disabled. Those who were neither Christians nor Jews, such as pagans, were given the status of Majus. The treatment of non-Muslims in the Caliphate has been a subject of considerable debate among scholars and commentators, especially those interested in drawing parallels to the coexistence of Muslims and non-Muslims in the modern world. Jews constituted more than five percent of the population. Al-Andalus was a key centre of Jewish life during the early Middle Ages, producing important scholars and one of the most stable and wealthy Jewish communities. Bernard Lewis takes issue with this view, arguing its modern use is ahistorical and apologetic. He argues that Islam traditionally did not offer equality nor even pretend to, that it would have been both a "theological as well as a logical absurdity," and that "the restrictions to which they were subject were social and symbolic rather than tangible and practical in character. The Caliphate treated non-Muslims differently at different times. 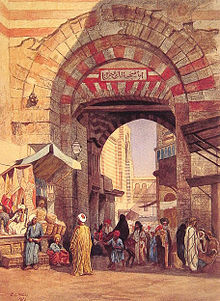 The longest period of tolerance began after 912 with the reign of Abd-ar-Rahman III and his son, Al-Hakam II, when the Jews of Al-Andalus prospered, devoting themselves to the service of the Caliphate of Córdoba, to the study of the sciences, and to commerce and industry, especially trading in silk and slaves, in this way promoting the prosperity of the country. Southern Iberia became an asylum for the oppressed Jews of other countries. Under the Almoravids and the Almohads there may have been intermittent persecution of Jews, but sources are extremely scarce and do not give a clear picture, though the situation appears to have deteriorated after 1160. Muslim pogroms against Jews in Al-Andalus occurred in Córdoba (1011) and in Granada (1066). However, massacres of dhimmis are rare in Islamic history. The Jews of Granada did not have dhimmi status. The Almohads, who had taken control of the Almoravids' Maghribi and Andalusi territories by 1147, far surpassed the Almoravides in fundamentalist outlook, and they treated the non-Muslims harshly. Faced with the choice of either death or conversion, many Jews and Christians emigrated. Some, such as the family of Maimonides, fled east to more tolerant Muslim lands, while others went northward to settle in the growing Christian kingdoms. One detail of the arabesques completed towards the end of Muslim rule of Spain by Yusuf I (1333–1353) and Muhammed V, Sultan of Granada (1353–1391), the Alhambra is a reflection of the culture of the last centuries of the Moorish rule of Al-Andalus, reduced to the Emirate of Granada. Many tribes, religions, and races coexisted in Al-Andalus, each contributing to its intellectual prosperity. Literacy in Islamic Iberia was far more widespread than in many other nations in the West at the time. From the earliest days, the Umayyads wanted to be seen as intellectual rivals to the Abbasids, and for Córdoba to have libraries and educational institutions to rival Baghdad's. Although there was a clear rivalry between the two powers, freedom to travel between the two caliphates was allowed, which helped spread new ideas and innovations over time. The historian Said Al-Andalusi wrote that Caliph Abd-ar-Rahman III had collected libraries of books and granted patronage to scholars of medicine and "ancient sciences". Later, al-Mustansir (Al-Hakam II) went yet further, building a university and libraries in Córdoba. Córdoba became one of the world's leading centres of medicine and philosophical debate. However, when Al-Hakam's son Hisham II took over, real power was ceded to the hajib, al-Mansur Ibn Abi Aamir. Al-Mansur was a distinctly religious man and disapproved of the sciences of astronomy, logic, and especially astrology, so much so that many books on these subjects, which had been preserved and collected at great expense by Al-Hakam II, were burned publicly. However, with Al-Mansur's death in 1002, interest in philosophy revived. Numerous scholars emerged, including Abu Uthman Ibn Fathun, whose masterwork was the philosophical treatise "Tree of Wisdom". Maslamah Ibn Ahmad al-Majriti (died 1008) was an outstanding scholar in astronomy and astrology; he was an intrepid traveller who journeyed all over the Islamic world and beyond and kept in touch with the Brethren of Purity. Indeed, he is said to have brought the 51 "Epistles of the Brethren of Purity" to Al-Andalus and added the compendium to this work, although it is quite possible that it was added later by another scholar with the name al-Majriti. Another book attributed to al-Majriti is the Ghayat al-Hakim, "The Aim of the Sage", which explored a synthesis of Platonism with Hermetic philosophy. Its use of incantations led the book to be widely dismissed in later years, although the Sufi communities kept studies of it. A prominent follower of al-Majriti was the philosopher and geometer Abu al-Hakam al-Kirmani. A follower of his, in turn, was the great Abu Bakr Ibn al-Sayigh, usually known in the Arab world as Ibn Bajjah, "Avempace"
The Al-Andalus philosopher Averroes (1126–1198) was the founder of the Averroism school of philosophy, and his works and commentaries had an impact on medieval thought in Western Europe. Another influential Al-Andalus philosopher was Ibn Tufail. As Jewish thought in Babylonia declined, the tolerance of al-Andalus made it the new centre of Jewish intellectual endeavours. Poets and commentators like Judah Halevi (1086–1145) and Dunash ben Labrat (920–990) contributed to the cultural life of al-Andalus, but the area was even more important to the development of Jewish philosophy. A stream of Jewish philosophers, cross-fertilizing with Muslim philosophers (see joint Jewish and Islamic philosophies), culminated with the widely celebrated Jewish thinker of the Middle Ages, Maimonides (1135–1205), though he did not actually do any of his work in al-Andalus because his family fled persecution by the Almohads when he was 13. ^ "Para los autores árabes medievales, el término Al-Andalus designa la totalidad de las zonas conquistadas — siquiera temporalmente — por tropas arabo-musulmanas en territorios actualmente pertenecientes a Portugal, España y Francia" ("For medieval Arab authors, Al-Andalus designated all the conquered areas — even temporarily —by Arab-Muslim troops in territories now belonging to Portugal, Spain and France"), José Ángel García de Cortázar, V Semana de Estudios Medievales: Nájera, 1 al 5 de agosto de 1994, Gobierno de La Rioja, Instituto de Estudios Riojanos, 1995, p.52. ^ "Andalus, al-" Oxford Dictionary of Islam. John L. Esposito, Ed. Oxford University Press. 2003. Oxford Reference Online. Oxford University Press. Accessed 12 June 2006. ^ Bossong, Georg (2002). Restle, David; Zaefferer, Dietmar, eds. "Der Name al-Andalus: neue Überlegungen zu einem alten Problem" [The Name al-Andalus: Revisiting an Old Problem]. Trends in Linguistics. Studies and Monographs. Sounds and systems: studies in structure and change. (in German) (Berlin: De Gruyter Mouton) 141: 149. ISSN 1861-4302. Retrieved 8 September 2013. 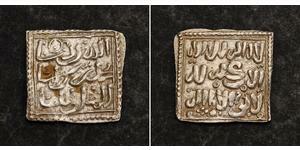 Only a few years after the lslamic conquest of Spain, Al-Andalus appears in coin inscriptions as the Arabic equivalent of Hispania. The traditionally held view that the etymology of this name has to do with the Vandals is shown to have no serlous foundation. The phonetic, morphosyntactic, and also historical problems connected with this etymology are too numerous. Moreover, the existence of this name in various parts of central and northern Spain proves that Al-Andalus cannot be derived from this Germanic tribe. It was the original name of the Punta Marroquí cape near Tarifa; very soon, it became generalized to designate the whole Peninsula. Undoubtedly, the name is of Pre-Indo-European origin. The parts of this compound (anda and luz) are frequent in the indigenous toponymy of the Iberian Peninsula. ^ Reinhart Anne Pieter Dozy (November 2009). Recherches Sur L'Histoire Et la Littérature de L'Espagne Pendant Le Moyen Age. BiblioBazaar. p. 303. ISBN 978-1-117-03148-4. ^ Joaquín Vallvé (1986). La división territorial de la España musulmana. Instituto de Filología. pp. 55–59. ISBN 978-84-00-06295-8. ^ Majmū'ah Akhbār; Emilio Lafuente y Alcántara (1867). Ajbar MachmuØa: Coleccion de tradiciones ; Crónica anónima del siglo xi, dada á luz por primera vez. M. Rivadeneyra. p. 255. ^ Bossong: The document in question is the Akhbar Majmu'a fi fath Al-Andalus, "Collection of traditions on the conquest of al-Andalus". It was published in Spanish translation in 1867 by Emilio Lafuente y Alcántara. Its subtitle indicates it dates from the 11th century, but several historians today say the 10th century instead, during the rule of caliph 'Abd al-Rahman III. ^ Levi-Provençal, (1950: p.48); Kennedy (1996: p.45). ^ Roger Collins, "The Arab Conquest of Spain, 710–797", pp. 113–140 & 168–182. ^ Henry Kamen, Spain 1469–1714 A Society of Conflict Third edition, pp 37–38. ^ Fernando Rodríguez Mediano (19 April 2013). The Orient in Spain: Converted Muslims, the Forged Lead Books of Granada, and the Rise of Orientalism. BRILL. p. 42. ISBN 90-04-25029-8. ^ Anouar Majid (2004). Freedom and Orthodoxy: Islam and Difference in the Post-Andalusian Age. Stanford University Press. p. 25. ISBN 978-0-8047-4981-7. ^ Patricia E. Grieve (19 March 2009). The Eve of Spain: Myths of Origins in the History of Christian, Muslim, and Jewish Conflict. JHU Press. p. 6. ISBN 978-0-8018-9036-9. ^ Stanley, Tim (24 April 2013). "The Muslim Brotherhood wants Spain back. Can the Christians have Egypt in exchange?". The Daily Telegraph. Retrieved 10 October 2014. ^ Wasserstein, 1995, p. 101. ^ Cohen, Mark R. (1994). Under Crescent and Cross: The Jews in the Middle Ages. Princeton University Press. ISBN 9780691010823. Retrieved 24 November 2012. ^ Lewis, Bernard W (1984). The Jews of Islam, p. 4. ^ Stavans, 2003, p. 10. ^ Kraemer, 2005, pp. 10–13. ^ O'Callaghan, 1975, p. 286. ^ Roth, 1994, pp. 113–116. ^ Frederick M. Schweitzer, Marvin Perry., Anti-Semitism: myth and hate from antiquity to the present, Palgrave Macmillan, 2002, ISBN 0-312-16561-7, pp. 267–268. ^ Harzig, Hoerder and Shubert, 2003, p. 42. ^ a b Frank and Leaman, 2003, pp. 137–138. ^ Kraemer, 2005, pp. 16–17. Saliba, George; Sezgin, F. (1981), "Review: Geschichte des arabischen Schriftiums. Band VI: Astronomie bis ca. 430 H by F. Sezgin", Journal of the American Oriental Society 101 (2): 219–221, doi:10.2307/601763, JSTOR 601763. Glick, Thomas (1999). "Islamic and Christian Spain in the Early Middle Ages: Comparative Perspectives on Social and Cultural Formation". Retrieved 23 October 2011. Dodds, Jerrilynn D. (1992). Al-Andalus: the art of Islamic Spain. New York: The Metropolitan Museum of Art. ISBN 9780870996368. The Art of medieval Spain, A.D. 500-1200. New York: The Metropolitan Museum of Art. 1993. ISBN 0870996851.